Are Tablet Computers a Viable Option for Work? Tablet computers are a hot topic, and with good reason. Tablets, and touch screens, are revolutionizing how we interface with our computers and how we do business with clients. But are tablet computers better suited for play, or are they a viable option for work too? When Android phones came on the scene, they made a big impression. So how do the Android tablets stack up? As far as work productivity goes, the Android tablet is not a good fit, yet. It is basically like using a larger version of your Android phone. While the larger screen and keyboard is nice, you may find that you experience the same frustrations working on your Android tablet that you do when working on your Android phone. Unfortunately, at this time the Android tablet is better suited for play. However, manufactures of Android products stay competitive, so don’t be surprised if they find a way to boost the work functionality of these types of tablets. Apple users love their Apple products, and the iPad is no exception. Aside from being an entertainment device, the iPad has some great apps which help increase work productivity. The Ipad is a viable work tablet option for some, depending on what you need to accomplish. Keep in mind, however, that most work networks are Windows based, so you may have issues switching between the two environments. A Windows based tablet is probably your best bet when it comes to a tablet that allows you to both work and play, because of how easily it integrates with other Windows products. However, the Windows based tablets are still catching up to all the fancy touch screen capabilities. While Microsoft focused on some of these features with Windows7, they have much better tablet support in Windows8. Another drawback with the Windows tablets is price – they are comparable to the price of a laptop. 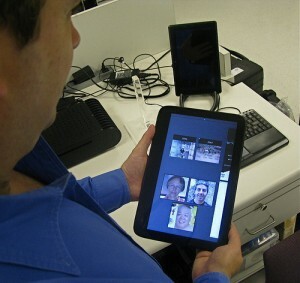 Click here to read a comparison between the iPad and Windows8 tablets. Do you use a tablet for work? How well does this arrangement function for you? Leave us a comment letting us know. Julie Strier is a freelance writer who enjoys helping you understand the ever changing technology landscape. Email: julie@mybusinesswriter.com. Website:www.mybusinesswriter.com.